Mobile phones and the beach are generally not a great mix, but for anyone looking to stay in touch while soaking up the rays there are a few more details filtering through regarding Sharp’swaterproof, solar-powered phone. Due for a June release in Japan through Japan’s KDDI wireless provider the new phone has finally gained a title, the Solar Ketai (Solar Mobile) and will be released as part of KDDI’s “au” line. The new phone will claim a world’s first in being the first waterproof phone to embed a solar panel into its lid. The solar panel can charge up to 80% of the battery’s capacity and can draw enough power from ten minutes of direct sunlight for a one-minute call, or two hours of standby time. Other details about the Solar Ketai are thin on the ground. Going by the picture it won’t be a touchscreen model like Samsung’s previously announced Blue Earth solar powered offering, but with still no release date set for the Blue Earth, it could beat its solar-powered competitor to market. The Solar Ketai by Sharp is expected to be priced somewhere in range of 40,000 to 60,000 yen, (approx. 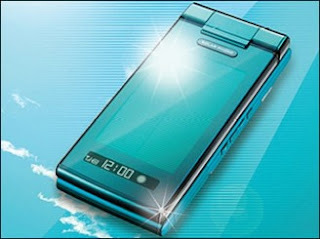 USD$420 - $630 at time of publication) and will be released in June through Japan's KDDI - just in time for summer. There's no word on if or when the phone will be released outside Japan.